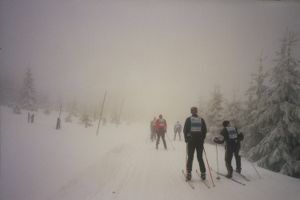 Until 10 days before the race weekend of Padesatka the conditions were poor. Not much snow, always changing temperatures, rain. Then the forcast for race was fine because snow should come. And the snow came, wet snow with wind and fog, many people speak from the real weather in the Iser mountains. As the year before 50k race was fully booked end of last year. That shows the popularity of this classic marathon with 30k freestyle on Friday. sport equipments or similar things. Around 500 starters have done the 30k freestyle race, winner was once more Jiri Rocarek from chzech republic. After the race was official opening ceremony with historical fashioned skiers at Bedrichov. Also worldloppet welcome party in the tent near start area. On saturday it starts to snow at afternoon. Always around zero degrees. 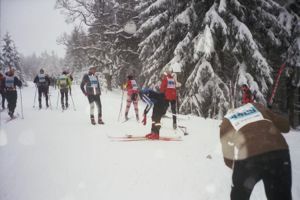 On Sunday it was a mix of cold-wet weather at Bedrichov and windy, snowy – foggy conditions at the top areas. the years before, most parts were prepared with 3 classic tracks. The first snow mobil with television was in front of the leading group, mostly in the middle, so that track was destroyed at first. The second was with the leader of woman, mostly at one side right or left, because first woman were in running in group of men. So with that soft snow the second track was also destroyed. And after some hundreds of skiers last track was flat like freestyle preparing. A lot of skiers decided to use non wax skis with mechanical grip part or just roughened grip area. It was almost a compromise at many parts of the race. Winner Rezac used a wax ski without grip wax. 2.21 hours double pulling , not realistic for average skiers. 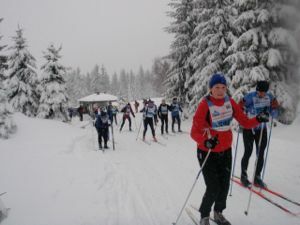 Under first 18 finisher were 10 from Norway and 4 from sweden, that’s also an indicator that Scandinavian skiers like and dominate the classic races in Europe. Winner of woman race was Sara Svendsen from Norway in 2.42 hours. 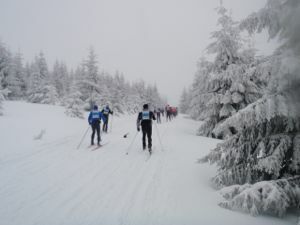 Exactly 1000 skiers finished the 25k short race on Sunday, that’s also a new record. In the Sunday afternoon snow fall was permanently, so it was important to have the heated tent in the finish area. Organisation, wave start included was very good again.